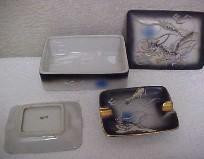 Vintage Black Dragonware Cigarette Box & 2 Ashtrays Japan.. Vintage DRAGONWARE porcelain cigarette box and 2 matching ashtrays. UNMARKED piece. 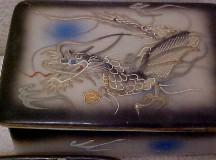 Lovely and unusual Dragonware Cigerette Case or Trinket Box. It measures about 6" in length, 4" in width and 2" in depth.. Wonderful color and very good condition. Soft blues with a black border and a gold trim . Astrays 4 3/8" by 3 3/8" .. I do feel some chips on the inside rim of the box very hard to see..No cracks and no chips or cracks on the ashtrays.. .. Over all in good used condition..
PRICE: $24.99 plus $1.50 special handling charge.